Kids always do best when they are interested in what they are asked to talk about. But every child has different interests, and therein lies the challenge – selecting awesome speech topics that kids will want to talk about. If the topic is too “adult,” they may be too young to cope with what they find. If the topic is too simplistic, their growing sense of awareness may be stunted. Keep in mind the goal of the speech – do you want to educate, to entertain, to express ideas, or something else? Consider topic that suits child’s character: someone who has an extensive imagination won’t like the same topics as someone who is more factual and practical. Here is a broad range of speech topics for kids you can choose from. Original projects to surprise my parents on Mother’s Day (in the Spring) and Father’s Day (often marked in June). My favorite band or singer, and one of his or her greatest hits I would like to play with some clarification. The best fairy tale, or a variation child speech topic can be a cartoon character. My favourite time of day or week. The funniest April Fool’s Day joke. Mom and my favorite place to visit is.. The contents of your lunch box. What would it be like if dinosaurs roamed the Earth? What rights should animals have? A day at the wildlife sea aquarium, with dolphins, sharks, whales and seals. How kangaroos care for their children. Where do clouds come from? If I was the President of the U.S…. My toys, dolls or mini racing cars collection. My trip to Disney World or other resort. How I decorate my room at home. Nice birthday presents you like to get. What you could do without television or video. Foreign hollidays we do not celebrate. Things – food or scary situations – that make you sick. If you are selecting a topic together, sit down with your child and read through this list together and make your own list of which topics stood out to your child. Suggest alternatives or adaptations to some topics. The goal is to get their juices flowing. You want this to be a choice that they are comfortable with. Help them decide by reminding them who their audience will be and what the occasion is. This will help determine what is appropriate and what the audience will want to hear. Your child probably wouldn’t want to talk about Barbie at a formal function or to an audience of mostly boys. All that’s left to do is prepare and practice, because we all know – practice makes perfect! 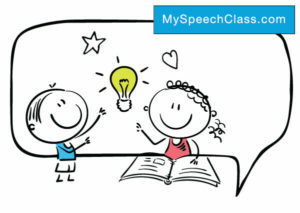 Cite this article as: dev, "130 Awesome Speech Topics for Kids," in My Speech Class, December 21, 2016, http://www.myspeechclass.com/speech-topics-kids.html. Sure! It’s about I only want a ribbon about u are afraid Togo on stage and don’t want to go to the next level except a good grade. You should keep some simple and affective topics on which children can speak on. it’s very good for a child under like 8 but i am 9 and i use it and when our teacher said were have a speech contest i flip out! but i found this web site and it helped me a lot. In fact, i won the speech contest!